Now that the guest bedroom is complete, I have been working on staging it. I wanted to create some unique art work that would enhance the space, but I had virtually no budget (as usual). After perusing Pinterest, I had a stroke of creativity. 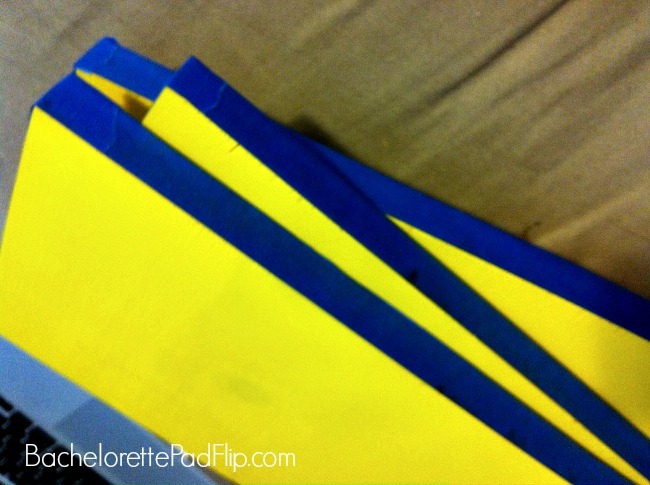 I had some scraps leftover from the DIY pantry shelves from Bachelorette Pad #1, and they were all uniform size. I decided to use those as a “canvas” for some really easy, almost-free art. I began by thoroughly sanding all sides of each board. I opted to use three of the boards because decorating should be done in odd numbers. Once each board was sanded, I wiped them down to remove all the dust. After the boards were sanded, I spray painted the top and sides. I opted not to waste spray paint on the back since nobody would see them. I could have used some of the cans of excess paint in my garage, but none of those matched. So I purchased a can of yellow spray paint at Walmart. I painted three coats on each board and still had leftover paint. After I painted each board, I taped the sides with painter’s tape. 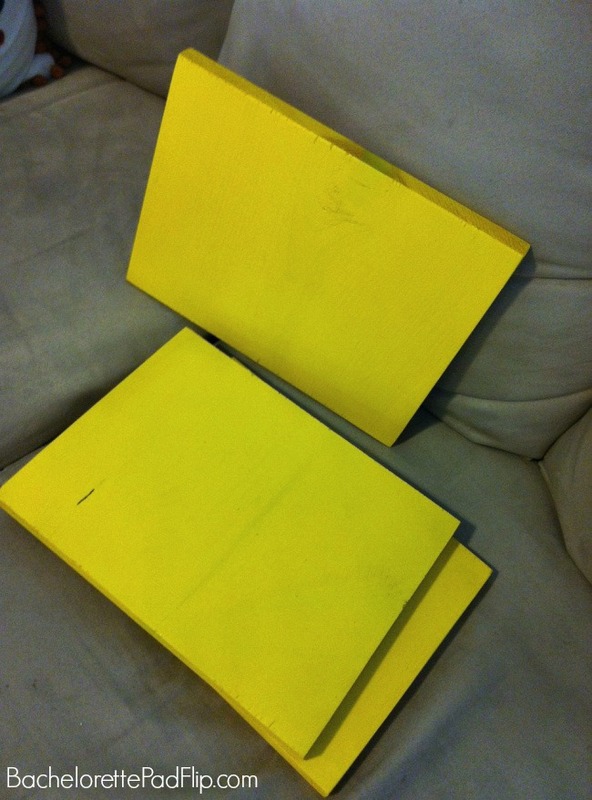 Since an additional step requires more paint, I wanted to protect the sides so they would have crisp yellow lines. 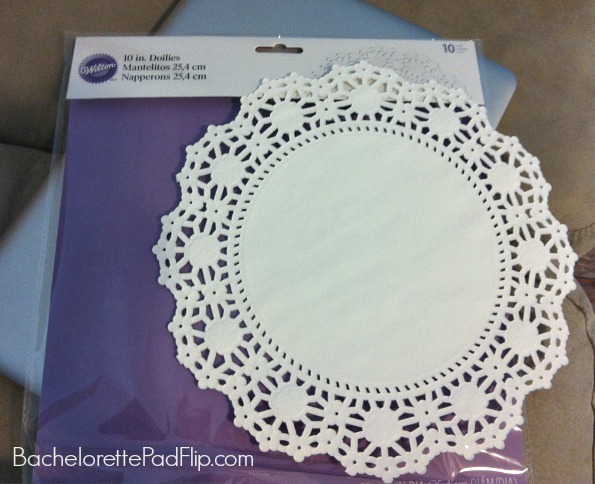 The next step was to purchase paper doilies. I thought they’d be easy to find, but they weren’t. I eventually found them in the cake/wedding aisle at Walmart for a little more than $1. That was the last purchase for this artwork, so total I spent about $5 for three separate pieces of art. I cut some of the doilies there wasn’t a rhyme or reason to how I cut them or what size. I then taped them on the board. 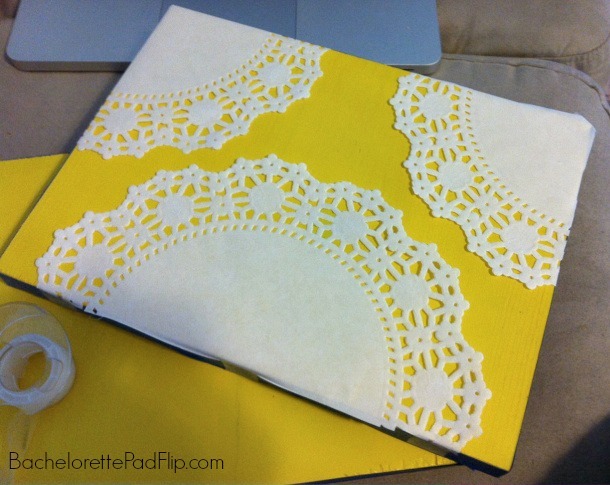 NOTE: Be sure not to tape over the doilie holes. I rolled some tape under the large white part and then taped over the edges. I made sure that each board had a different doilie pattern. The last step is to use some white spray paint (I had some leftover) and paint over the paper doilies that are taped to each board. It only took one coat of paint. 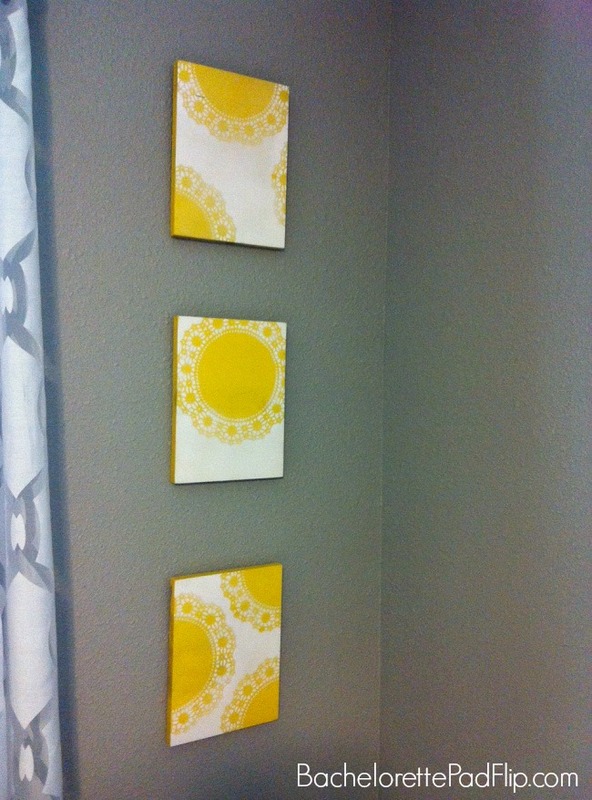 Once the paint was dry, I removed the paper doilies and painter’s tape. This little DIY project took less than hour and for $5, I love how they look! 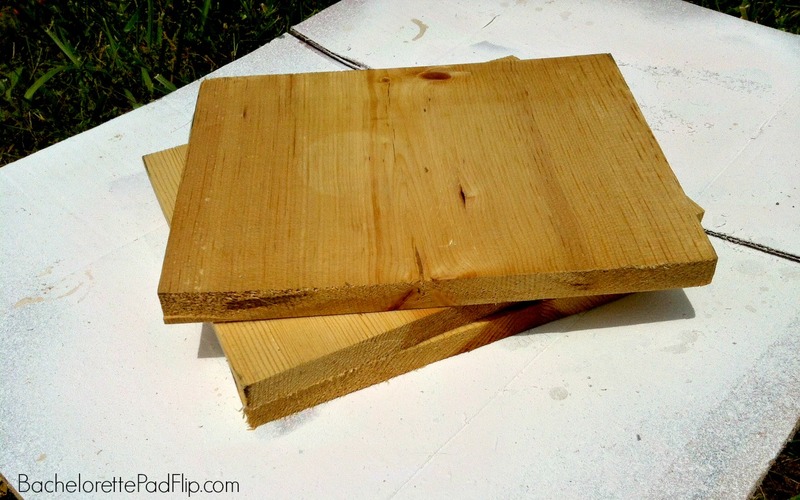 If you don’t have scrap wood, Lowe’s sells boards in the lumber section and will cut them down to whatever size you choose (for free! ).